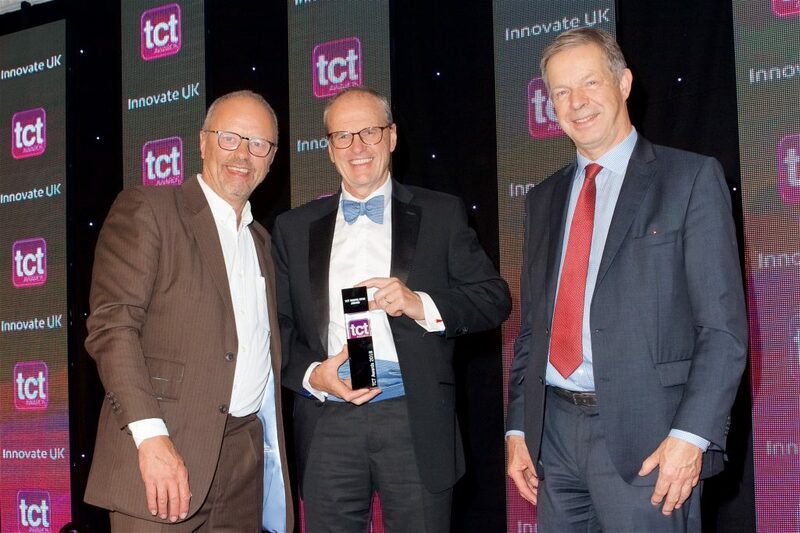 The TCT awards is a prestigious event that celebrates the best innovations in design-to-manufacturing technology. Designed to celebrate groundbreaking applications and technology advancements, the evening was a huge success, and HiETA Technologies are proud to announce that we were awarded the 2018 TCT Rising Star award. 2018 has seen HiETA transition from primarily a research and development company into a product company. HiETA is now highly regarded as a world-class product development company and boasts an enviable list of blue-chip customers. It’s also known as being a fantastically innovative place to work and has attracted over 50 top-flight staff from a range of backgrounds. HiETA’s impact on the industry is apparent on two levels. Firstly, HiETA’s products are a stunning realisation of clean-sheet design. Unencumbered by legacy products or a culture of ‘this is how we do things around here’, HiETA’s products, besides performing phenomenally, are also beautiful. Our annular heat exchangers are becoming a product synonymous to Additive Manufacturing (AM) and have featured on the front of a number of publications, including TCT magazine. Through this, HiETA is able to communicate to non-specialist engineers about the tremendous realities of products that are truly designed for Additive Manufacturing. Secondly, HiETA has and continues to achieve things that previously people have said are impossible. Firstly, we proved that a functional heat exchanger could be made using laser powder bed AM, secondly, we showed that AM heat exchangers can comfortably outperform those made conventionally. Thirdly, the company is showing that this can be done reliably and economically in a production environment. To achieve this, HiETA has lead the way in establishing a full AM-specific value chain. HiETA Technologies is an ambitious company and expects to have a tremendous impact across a range of sectors, and we are proud to have been awarded the 2018 TCT Rising Star Award. HiETA Technologies Limited is a product design, development and production company based in Bristol & Bath Science Park exploiting Additive Manufacturing (AM). HiETA’s heat exchangers are typically 40% smaller and lighter and our turbomachinery can operate at up to 200°C higher than those available elsewhere. We target 40% efficiencies for micro gas turbine systems.